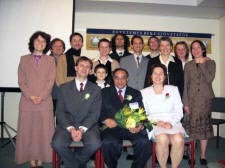 As part of the 4th World Tour, Hungary welcomed five US Ambassadors for Peace on November 2nd 2006: Mrs. Carolyn Lincoln, Mr. Nath Amar Gupta, Rev. 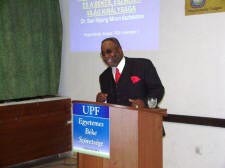 Isaac William Artis Jr., Rev. 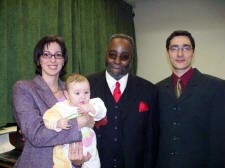 Nagi Fouad Yousef and Rev. Notburga Maria Hutcherson. After their arrival at Budapest Airport, they immediately left for their various venues. Those who had to go to other cities did not have even time to settle in, the Hotel and eat something and ate fast food in the car while traveling. After finishing their speech events, they traveled back to Budapest late at night and the next morning left early for another nation. What a challenging schedule! During their stay in Hungary, they were very energetic, kind, smiling and encouraging, never expressing disappointment or struggle because of their age. Rev. Artis went to Szeged, Mrs. Lincoln to Pécs, Rev. 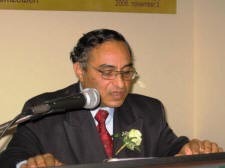 Yousef traveled to Gyõr and Mr. Gupta and Rev. 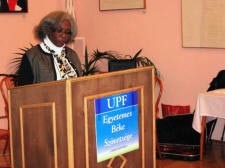 Hutcherson delivered their speeches in Budapest . It was so beautiful to see how these US clergy from different religious background loved each other, sharing freely and working together for God’s will! All the speakers gave very moving testimonies. Mr. Gupta testified how he had fully recovered from incurable cancer after receiving the Peace Blessing from True Parents. 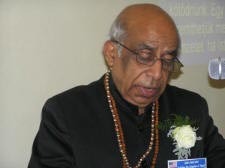 Mr. Gupta also said that because of his health condition, he had wanted to stop the tour, but when he heard that Father Moon was concerned about him, changed his mind. He said, ‘If Father Moon wants me, what can I do? Only continue’.